Here is the recording of the radio show Linda did with Starseed Radio Academy on July 24, 2012. This show lasted for 2 hours. Linda was able to go into great depth, telling many stories of her experiences with the dolphins and the Dolphin Consciousness. Many listeners called in with questions, and these brought out beautiful stories and teachings. Including ... Lindas' first mermaid encounter! Highly recommended! This is the show that is highlighted in our Summer 2012 Newsletter. Loana Morgan turned her whole show over to Linda and David. 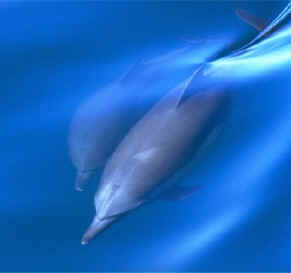 The subject is Self Love - Love and Wisdom From the Dolphins. This show is only 40 minutes long. At the end of the show, Linda leads a very beautiful and powerful inner process to lead you into a state of deep and expansive self love. You may want to listen to this often! EnJOY! On March 31, 2011, I had the joy and privilege of being interviewed by my dear friend and podmate, Karen Sheeks, on her internet radio show, Mount Shasta Moments. Karen lives in Mount Shasta, California, one of my soul homes on the planet. She was a member of the Northern California Dolphin Healing Hearts pod that graduated in April 2008. This is my first radio interview since returning from my 8-month sabbatical in February. Because Karen has experienced Dolphin School directly, she brings a unique perspective to our conversation. In our interview, she skillfully guides me to the most essential topics, and she shares her own perspective of the Dolphin School journey from her deep inner knowing. The love and connection that Karen and I share are palpable, and convey a joy and intimacy that’s heart-opening and lovely. I love this new interview! It really carries the new frequencies that have come into my work. If you’d like to hear me speak about what this work is about, and feel the new quality of dolphin energy that is moving through me now, this is an hour well spent. Towards the end of the interview, I lead a dolphin energy meditation that will bring you into direct connection with the Dolphin Consciousness, and with the pure love and joy that resides within you. MP3 - Linda and Karen on Mount Shasta Moments. To learn more about Karen Sheeks, this amazing woman and clairvoyant who is sharing herself, and her unique gifts in the world, in such beautiful and profound ways, visit www.shastalight.com. Follow her blog and listen to her other radio interviews on Align Radio, at www.shastalight.com/blog. Thank you, Karen, for the wonderful opportunity of sharing my story with the world in this way. You’re awesome!! Recently, we (Linda and David) have had several opportunities to speak about the Gift of the Dolphins, and our work with the Dolphin Consciousness, on radio talk shows on the internet. In each of these interviews, we share about different aspects of what we do, different aspects of this gift that the dolphins are bringing to humanity in this moment of our evolution. Each interview also includes a guided dolphin meditation led by Linda. These meditations came in intuitively in the moment, so each one is unique. Mark Patterson hosts the show Dynamic Transformations. Our interview with Mark took place on January 19, 2009. This interview delves deeply into the question "who are the dolphins, really?" Anthony Brice, the host of Six Degrees, interviewed us on Jan. 13, 2009. Anthony's radio show is available on both blogtalkradio and the Law of Attraction Radio Network. We really enjoyed our interview with Anthony, and we think it's a great introduction to our school and the gift the dolphins are bringing to humanity. You can listen to our interview with Anthony here. Daniel Stief and Kaleah LaRoche are two Sedona friends of ours who host their show Good Morning Planet Earth on Sedona Talk Radio. On August 25, 2008, we spent a lovely hour with Daniel and Kaleah discussing Dolphin Energy Healing and our school Dolphin Healing HeArts. This is an interview where we speak very personally about ourselves, and the journey we have been on. You can listen to our interview with Dan and Kaleah here. ParaVisie is a popular spiritual magazine in the Netherlands. In December 2003 they featured Linda on the cover of their magazine. The cover story, "Dolphins, Angels of the Sea - Linda Shay brings you into contact" is a wonderful introduction to Linda and her work. It was written by Dutch writer Marjolein Wolf, who spent several hours interviewing Linda to gather the material for the article. Thea Draaisma, our Sedona Dutch friend, translated this article into English. Pauline de Jong, our Dutch podmate, reformatted the English translation into a PDF file with the same cover page, pictures and formatting as the original Dutch magazine article. Thank you to both of you! Click on this link to read or download the English translation, in PDF format. The Gift of the Dolphins - July 2004. This was published in Vision Quest Metaphysical Bookstore's monthly newsletter. Hawaii Dolphin Swim Information. Linda often receives questions from people who would like to go to Hawaii to swim with the dolphins physically. We do not lead swim trips ourselves, but Linda has compiled some information for people who wish to pursue this experience. Dolphin Books and CD's. A recommended list for further reading and listening. The Birth of Dolphin Heart World. February 1997. The Dolphins on Creating. May 1997.